November is American Indian and Alaska Native Heritage Month. The month celebrates rich and diverse cultures, traditions, and acknowledges the important contributions of Native people. It’s also an opportune time to educate the general public about tribes, to raise awareness about the unique challenges Native people have faced historically and in the present, and how tribal citizens have worked to conquer these challenges. This annual period provides a platform for Native people to share their culture, traditions, music, crafts, dance, and ways of life and opens the opportunity to express to their community, local and state officials concerns and solutions for building bridges of understanding and friendship in their local area. America needs to remember Native peoples have participated in every major U.S. military encounter from the Revolutionary War to today’s conflicts in the Middle East, serving at a higher rate in proportion to their population than any other ethnic group. At https://bookstore.gpo.gov is a fascinating fourteen volume collection from the Smithsonian Institution’s Handbook of North American Indians series, the ultimate resource for Native American history across various regions of North America. The set summarizes of what’s known about the prehistory, history, and cultures of the aboriginal peoples of North America north of the urban civilizations of central Mexico. Some volumes feature specific tribes located in geographic areas across the U.S. including: the Plains, Great Basin, Arctic, Northwest Coast, Southwest, California, North and South East, etc. On May 13 1983, President Ronald Regan signed a proclamation declaring it “American Indian Day” in honor of the Native American people who first settled this land. For the entirety of the existence of our country, there have been treaties between the Native American tribes and our Government, but in January of 1983, Reagan’s administration set forth to strengthen the ties and to increase the sovereignty of the individual tribes. Since then, each president has proclaimed November as “American Indian Heritage Month” and continued the honor for the first settlers of this land. The U.S. Government Publishing Office (GPO) makes these proclamations, including the original 1983 Proclamation 5049, available in digital files through govinfo. As the GPO continues its efforts to digitize vital Government documents, the history of our Nation and the story of the continued collaboration with the sovereign Native American tribes will be documented and provided to the public for free. It’s all part of our mission in Keeping America Informed. If you’re interested in learning more about the History of the American Indian tribes, visit the GPO Bookstore and pick up a volume of the Smithsonian’s Handbook of North American Indians series. It is the ultimate resource for Native American history across various regions of North America. The multi-volume hardcover reference set is intended to give an encyclopedic summary of what is known about the prehistory, history, and cultures of the aboriginal peoples of North America north of the urban civilizations of central Mexico. About the author: Blogger contributor Scott Pauley is a Writer and Editor in GPO’s Library Services and Content Management office. If you’re lucky enough to be in Maryland during the month of September, the Star-Spangled Spectacular is a free festival that celebrates the 200th anniversary of our National Anthem. Tall ships, Navy ships, and the Blue Angels will come to Baltimore’s Inner Harbor. Landside festivals include living history demonstrations. Events crescendo on September 13, 2014 with two star-studded patriotic concerts and extraordinary fireworks display over Fort McHenry and the Baltimore harbor, which will broadcast live on PBS’ Great Performances. Learn more here. You can check out the National Park Service’s Fort McHenry page for details about the park, its history, and the festivities. The U.S. Government Printing Office offers publications and resources to help you learn more about this pivotal point in American history. Available through the U.S. Government Bookstore, The Citizen’s Almanac: Fundamental Documents, Symbols, and Anthems of the United States, contains information on the history, people, and events of the United States. This resource is primarily targeted at immigrants hoping to become U.S. citizens. However, it can also serve as a patriotic resource for elementary school-age children through freshmen in high school. Teachers of social studies and civics programs may want to have a copy handy to use in classrooms. Some examples of things covered in the publication are: rights and responsibilities of citizens, the Star-Spangled Banner, the Pledge of Allegiance, the Gettysburg Address, the Constitution, landmark decisions of the Supreme Court, and much more. A related resource is the Civics and Citizenship Toolkit. GPO’s Catalog of U.S. Government Publications provides access to a fascinating document from the Smithsonian, National Museum of American History: The Star-Spangled Banner: State-of-the-Flag Report, 2001. This document describes the history of THE flag that inspired our National Anthem, where it has traveled since 1814, the conservation project undertaken to preserve it for future generations, and more. Also check out this information from the Smithsonian on the Star-Spangled Banner. 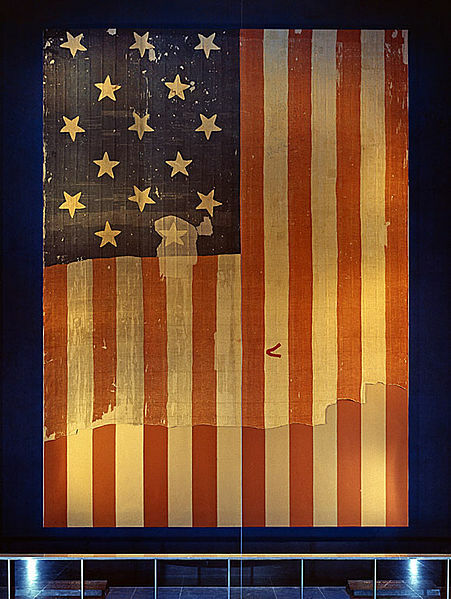 You can also learn about the flag’s preservation project here. 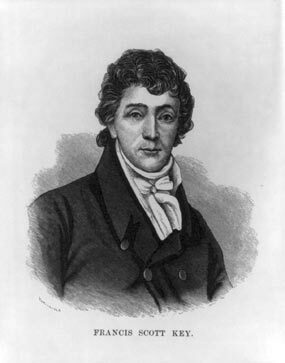 You can also learn more about Francis Scott-Key here. You can also visit a Federal depository library near you to discover what other publications the Federal Government has to offer on this incredible moment in American history. Locations are nationwide. Find the Federal depository nearest you by visiting the Federal Depository Library Directory. The U.S. Capitol and National Mall are a beautiful representation of the dignity and public spirit of the United States of America. This area is steeped in history, and you can learn more about the past and continued efforts to design, build, and preserve the U.S. Capitol and National Mall through many government publications. With its famous dome celebrating its 150th anniversary in December 2013, the United States Capitol is a treasure-trove of civic art. Just released, To Make Beautiful the Capitol: Rediscovering the Art of Constantino Brumidi gives a detailed history of renowned Italian-born artist Constantino Brumidi’s masterful work in “making beautiful” the walls and ceilings of the United States Capitol in a span of 25 years starting in 1854. Every page delights with gorgeous, full-color photographs and images of Brumidi’s art, from photographs of the frescoes and decoration, to sketches, paintings and images of the artist, particularly the Brumidi Corridors and his “monumental fresco” in the Capitol Rotunda, called The Apotheosis of Washington. Fascinating anecdotes are included throughout of the artist and the inspirations he received for various elements, his relationship with engineer Montgomery C. Meigs, and the conservation efforts to preserve his work accurately for posterity. Read more about this publication and others about art in the Capitol in our prior blog post, National Treasure: The art and architecture of the US Capitol. The primary oversight board for projects in the National Mall area is the U.S. Commission of Fine Arts, which was established by an act of Congress on May 17, 1910 in Public Law 61-181. This commission was created as an independent review agency for the work of designing the national capitol and to guide the architectural development of Washington. The commission’s role was expanded with later passage of the Shipstead-Luce Act of 1930 (Public Law 71-231 and Public Law 76-248), and the Old Georgetown Act of 1950 (Public Law 81-808). The U.S. Commission of Fine Arts has a long history of guiding the development of the nation’s capital. Several resources are available in print and online to learn more about the commission’s history. The National Park Service maintains a detailed guide linking to documents and reports that detail the area history. The Mall Cultural Landscape Inventory, part 2 contains several pages describing the history of the Senate Park Commission and its formation into the U.S. Commission of Fine Arts. The U.S. Commission of Fine Arts published a monograph in 2006; Designing the nation’s capital: the 1901 plan for Washington D.C. This 359 page monograph contains illustrations in color and black and white, as well as maps. The National Park Service provides full text access to this title online. 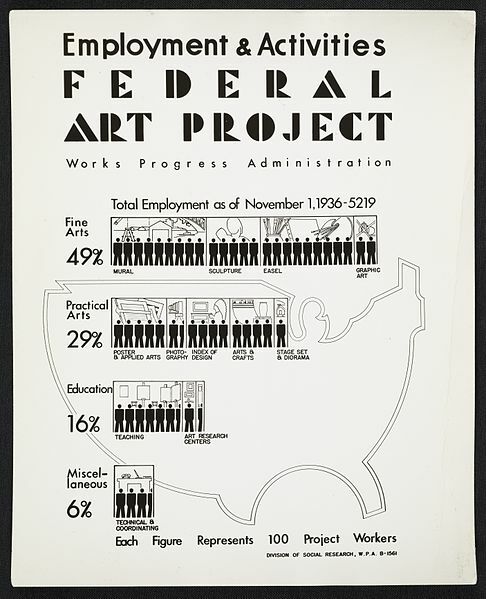 In addition to this title, several editions of this history of the U.S. Commission of Fine Arts from 1910 to date were published in 1964, 1977, 1981, 1985, 1991, and 1996. The most recent addition to the volumes available about the history of the commission is celebrates 100 years of the work of the commission. Civic Art : a centennial history of the U.S. Commission of Fine Arts is a beautiful, 626 page monograph with illustrations, maps and plans. It is a comprehensive history of the agency and includes original essays by prominent architects and landscape architects including Arleyn Levee, Carroll William Westfall, and Richard Guy Wilson. Another beautiful book that features some of the history of the national mall area is A Botanic Garden for the Nation: The United States Botanic Garden. You can read more about this publication in a previous post on Government Book Talk. For more information about the U.S. Capital building, you can also check out the publications highlighted in the previous Government Book Talk post on the 150th anniversary of the completion of the Capital Dome. To read more about the history of the Smithsonian, you could visit a depository library and check out the publication, America’s Castle: the evolution of the Smithsonian Building and its institution, 1840-1878. If you are interested in the official records of the commission, you can locate them at the National Archives. 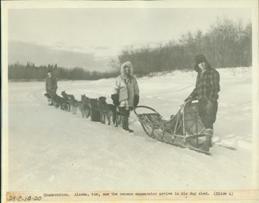 The record collection includes administrative history, annual reports, and a selection of still photographs. The records are divided between College Park, MD and Washington DC. Many of the records pertaining to the building and continued development of the National Mall are available at the National Archives, such as the National Park Service Records for the National Capital Region, and the Records of the Office of Public Buildings and Public Parks of the National Capital. How Can I get this book and other publications about history of the U.S. Commission of Fine Arts? Click here to browse our entire EBOOK collection. Shop our Retail Store:Buy a copy of any print editions from this collection at GPO’s retail bookstore at 710 North Capitol Street NW, Washington, DC 20401, open Monday–Friday, 9 a.m. to 4 p.m., except Federal holidays, Call (202) 512-0132 for information or to arrange in-store pick-up. Visit a Federal Depository Library:Search for U.S. Government publications in a nearby Federal depository library. You can find the records for most titles in the Catalog of U.S. Government Publications or CGP. About the author: Our guest blogger is Cathy Wagner, a GPO Outreach Librarian for the U.S. Government Printing Office’s Library Services & Content Management (LSCM) Division. Additional content, images and editing provided by Trudy Hawkins, a writer and marketing specialist in GPO’s Publication & Information Sales Division supporting the U.S. Government Online Bookstore (http://bookstore.gpo.gov). Veiled in secrecy for 72 years because of privacy protections, the 1940 U.S. census is the first historical federal decennial survey to be made available on the Internet initially rather than on microfilm. In a great example of a private/public partnership, Archives.com’s parent company partnered with the National Archives to provide the public with free digital access to the 1940 Federal Population Census. Miriam Kleiman, spokeswoman for the U.S. National Archives, told The Associated Press that the Archives’ 1940 census site registered more than 22 million hits in just four hours from almost 2 million users on its very first day of release. It is extremely popular already with librarians, researchers and genealogists researching their family tree. Last week’s release of digitized information covers detailed records on 132 million people living in the United States at the end of the Depression and a year before Pearl Harbor. The census data was transferred to microfilm during World War II, and in 2009, National Archives personnel began digitizing those records, culminating in the release of the database last week. Over 3.9 million images were digitized, providing a bonanza for researchers. 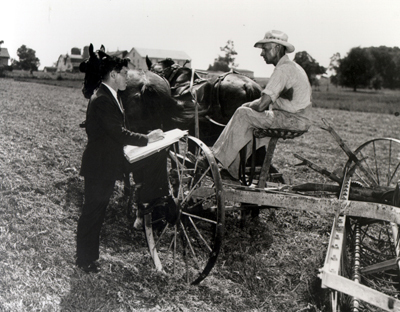 The Census Bureau began the 1940 census with extensive long-term planning, recruiting and training. 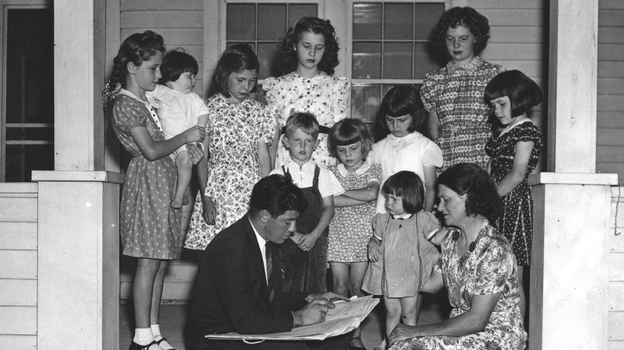 Back in 1940, about 120,000 census-takers, called enumerators, spread out across the U.S. and territories, going door-to-door to interview families. Enumerators both then and now can face challenging situations when gathering the data to tabulate the census, from trudging through fields or mushing a dog sled across the snow. 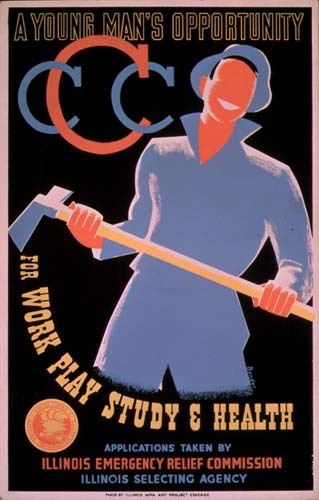 Another New Deal program mentioned in the census was the Civilian Conservation Corps or CCC . It was designed to provide employment mostly for young men in relief families who had difficulty finding jobs during the Great Depression (there were separate programs for veterans and Native Americans), while at the same time implementing a general natural resource conservation program in every state and territory for the “conservation and development of natural resources in rural lands” owned by federal, state and local governments. Many trees were planted and national and state parks built and preserved by the CCC. Another youth-focused program referenced was the National Youth Administration or NYA that focused on providing work and education for young Americans between the ages of 16 and 25. Was this person AT WORK for pay or profit in private or non-emergency Government work during week of March 24-30? (Yes or No). If not, was he at work on, or assigned to, public EMERGENCY WORK (WPA, NYA, CCC, etc.) during week of March 24-30? (Yes or No). Even for those not steeped in genealogy research will find it thrilling, like I do, to see the excitement build over the release of these images. It might be fun to look up my ancestors because I know my grandfather worked for the W.P.A. I’m also interested in looking at the various trends and metrics available on housing to see if there is any correlation to the current economic situations. Visit the National Archives pages to see the various resource location aids, enumerator training videos, and question templates that have been gathered for your use. Based on the times, there were specific instructions for enumerators to get a count of temporary housing such as huts, tents, and cabins as of a point in time. Here’s one bit of instruction to help clarify how to count the large transient population: “Persons in hotels, tourist or trailer camps, missions, and cheap one night lodging houses (flophouses) will all be enumerated as of the evening of April 8th”. The Census Bureau is appealing to the public for help indexing and meta tagging the images. This is a genealogy crowdsourcing project to ensure the 3.8 million images are indexed and freely searchable online. You, too, can register to be a 1940 Census Blog Ambassador and get a nifty badge for your page! 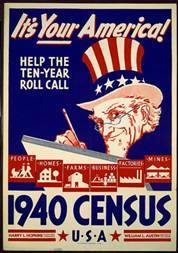 You can follow the 1940 Census via Twitter at: #1940Census #Genealogy #history. How can you get other Census Bureau publications today? The release of the historic images will be made at 1940census.archives.gov. For those interested in more current information, take a look at the resources in GPO’s U.S. Government Bookstore. The subscription series help keep you updated on the Census and Population statistics as they are released. Browse our entire collection of Census publications at the GPO Online Bookstore by searching for “census”. Statistical Abstract of the United States 2012 (Hardcover) and Statistical Abstract of the United States 2012 (Paperback). The Statistical Abstract of the United States, published since 1878, is the best-selling statistical reference book for researchers, education and commerce. It includes a summary of statistics on the social, political, and economic organization of the United States from the Census Bureau and other sources they compile. It is designed to serve as a convenient volume for statistical reference and as a guide to other statistical publications and sources. Census Atlas of the United States (Hardcover) This is the first general population and housing statistical atlas published by the U.S. Census Bureau since the 1920s. Buy them at GPO’s retail bookstore at 710 North Capitol Street NW,Washington, DC 20401. Open Monday-Friday, 9am to 4pm, except Federal holidays. Call 1. (202) 512-0132 for more information. Guest blogger: Nancy Faget, one of our federal librarians in GPO’s Library Services & Content Management Division who writes often about NASA “rocket scientists” and digital innovations in the library field. A couple of weeks ago, I was reading a book about various attempts by Japan to attack the U.S. and Australia between 1942 and 1945. Among these ventures was the attack on Sydney Harbor by midget submarines, a submarine-based seaplane incendiary bombing of Mount Emily, near Brookings, Oregon, and the 1944-45 launching of 9,000 balloons that dropped explosive and incendiary bombs across the U.S. and Canada as far east as Michigan. I don’t know about other readers of that book, but when I got to the bomb-bearing balloons, I thought, “Smithsonian Annals of Flight!” This publication series, which ran from 1964 to 1974, produced 10 booklets on various aspects of the history of aviation, all of which are worth reading. The one I remembered was Japan’s World War II Balloon Bomb Attacks on North America, an exhaustive study of the strategic concept (a Japanese desire for retaliation after the 1942 Doolittle raid on Tokyo and subsequent American bombing), the years of research and development of various prototypes, and how the approximately 9,000 paper (!) balloons were constructed and launched. The author makes the interesting point that the main reason these attacks failed to achieve the psychological victory anticipated by Japan was the total secrecy with which the American government and media greeted the aerial invaders. Since the Japanese military failed to learn anything about the fate of this extraordinary weapon and faced a growing shortage of resources by early 1945, it simply gave up. By then, though, the remnants of many balloons had been recovered on U.S. and Canadian soil, several had been shot down by fighter planes, and, tragically, a woman and five children were killed when they triggered a balloon bomb they found in the Oregon woods during a church picnic. Although the balloon bomb campaign failed, it did have the potential to cause extensive damage to the war effort by starting forest fires, as well as damaging civilian morale. Scary note: one bomb landed near the Hanford nuclear facility involved in the Manhattan Project but resulted only in an electrical outage – whew! Japan’s World War II Balloon Bomb Attacks on North America tells a fascinating and little-known story of World War II that also describes the first intercontinental weapon of war – and unfortunately, not the last. You can read this publication here or drift over to a library to read it. It was later reprinted by Smithsonian Institution Press using a more colorful cover than the original, and either edition can be found via various used book Web sites. You are currently browsing the archives for the Smithsonian Institution category.